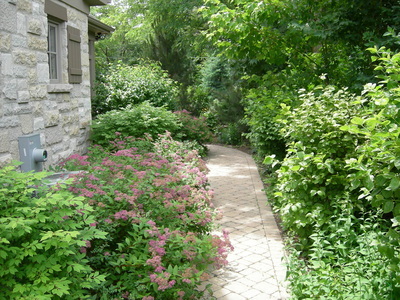 This property is located in a densely wooded area in the far Northwestern Suburbs. 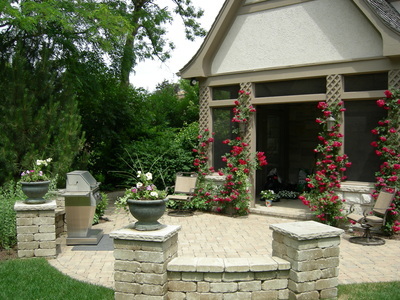 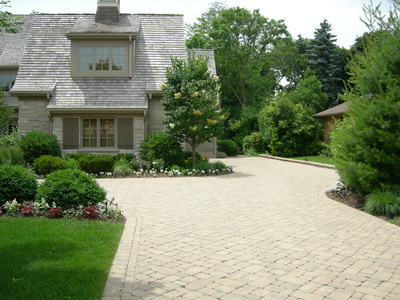 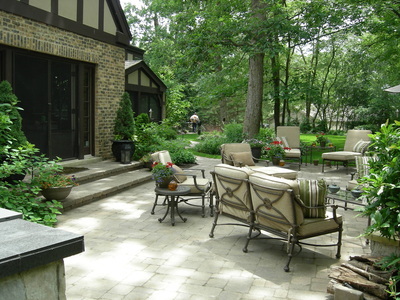 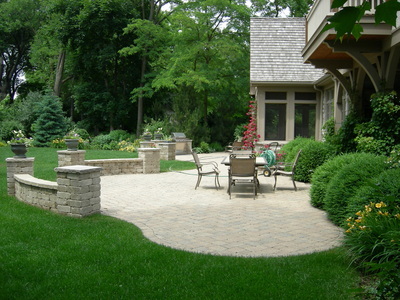 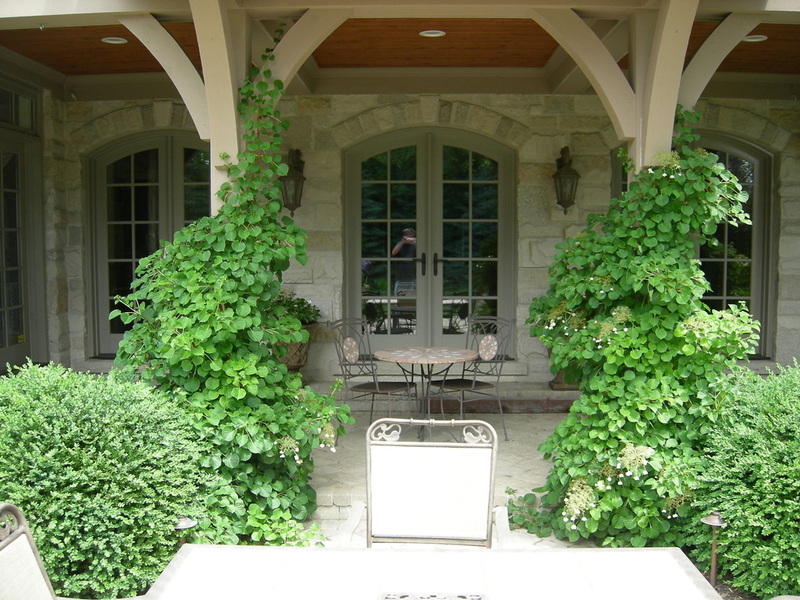 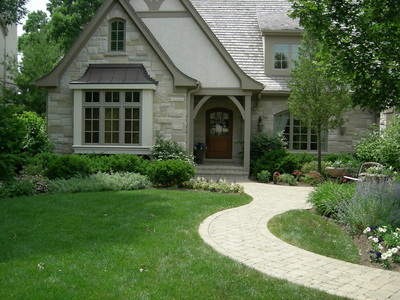 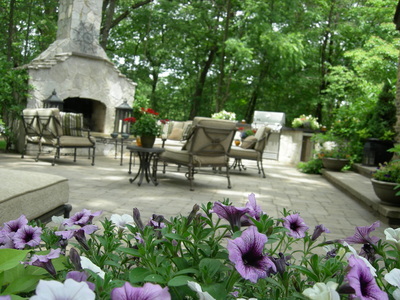 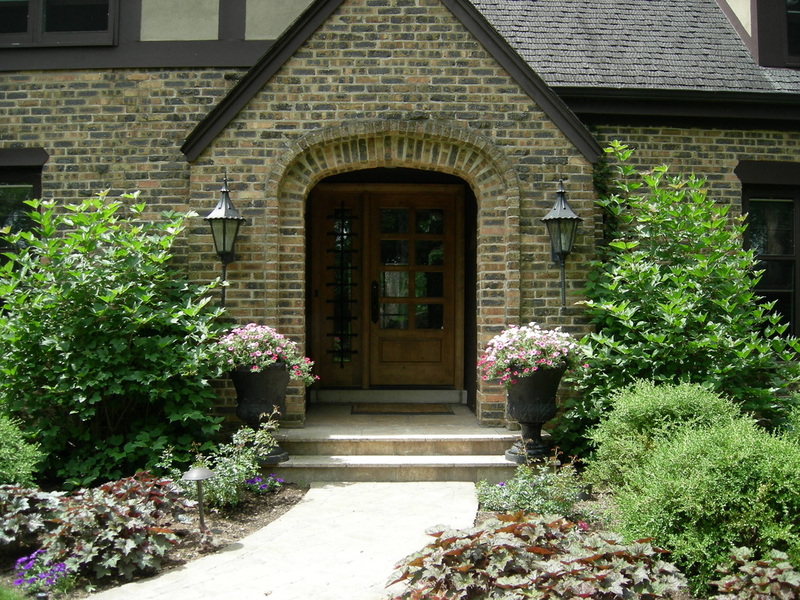 Our client desired a total makeover of all the existing landscape elements surrounding the home. 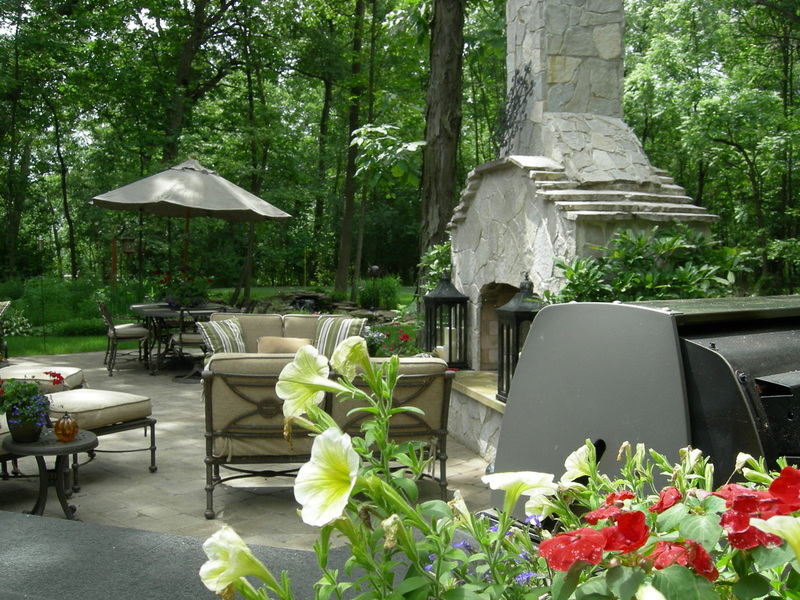 Working closely with the owner, we designed an overall plan with a naturalistic curvilinear theme that incorporated his desires for the property. 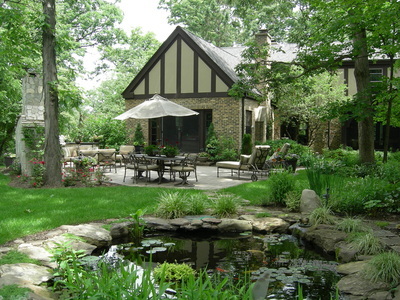 The plan included a new brick front entrance walk with low brick walls and column features, a sizeable on-grade rear brick patio, an outdoor fireplace and grill enclosure made from natural stone, a pond capable of supporting the overwintering of Koi fish and a synthetic putting green. During the construction of the improvements, we had to take special care to not jeopardize the health of the existing large oak trees and took numerous steps to avoid grade changes and minimize the compaction of the soil containing the roots of these trees. 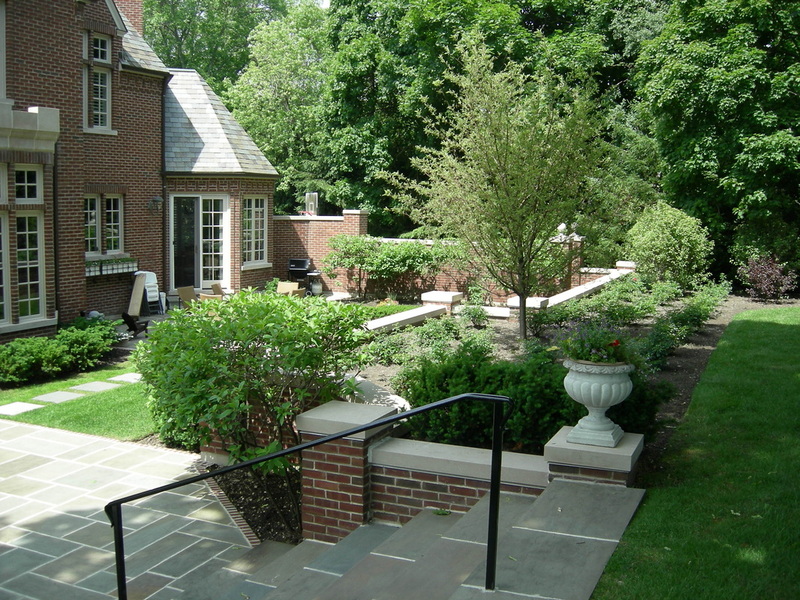 The pallet of plant material we used on this project relied heavily on the use of boxwoods, yews, hydrangeas, serviceberries and viburnums that could withstand the heavy shade found on the property. 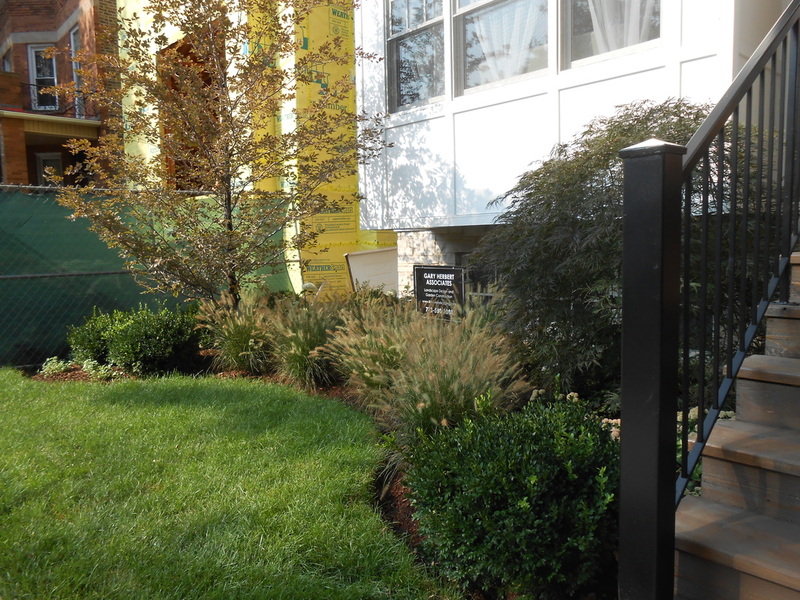 This new construction home in the Western Suburbs, presented the opportunity to design and install comprehensive landscape improvements while starting with a “blank slate”. During the construction of the residence, the entire site was cleared of all vegetation and only hard packed clay soils remained. 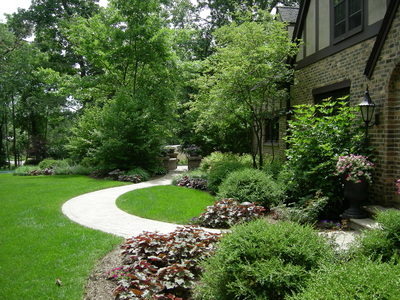 The owners of the home hired our firm after watching us construct the landscaping treatment of a similar property in an adjacent town. Plans were prepared paying special attention to this client’s desired improvement goals and material choices. The project was built in a single phase and included the construction of the driveway, front entrance and side yard walkways, a large rear patio area and a covered breakfast terrace. 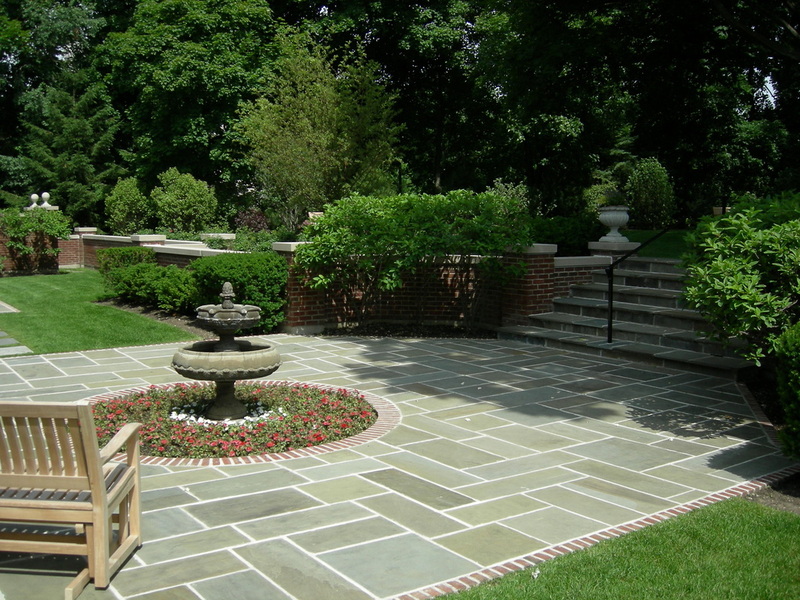 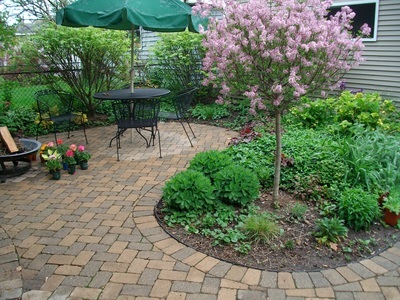 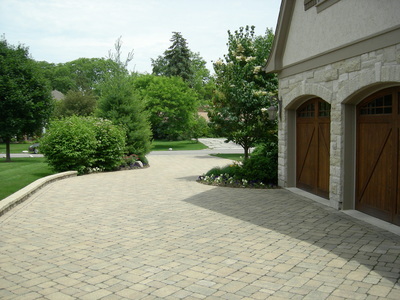 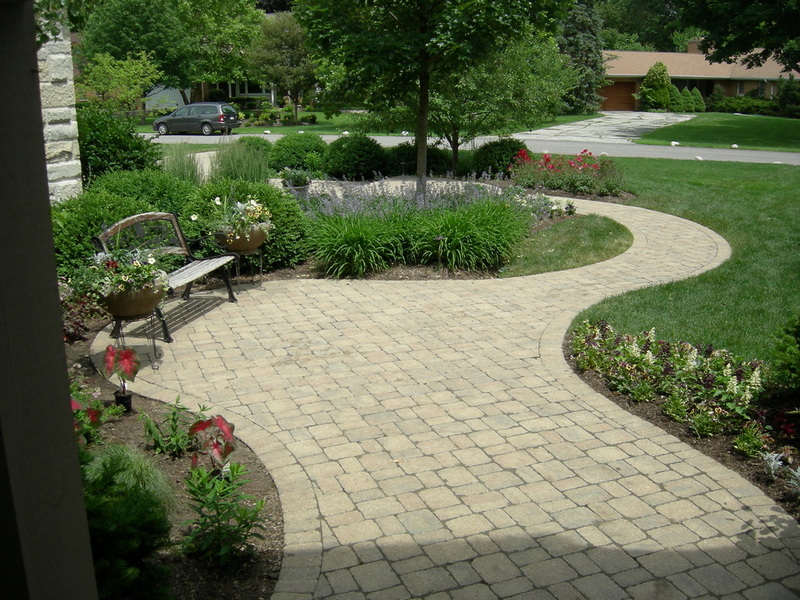 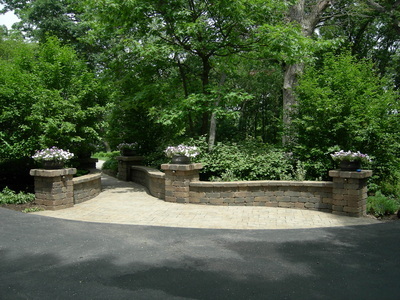 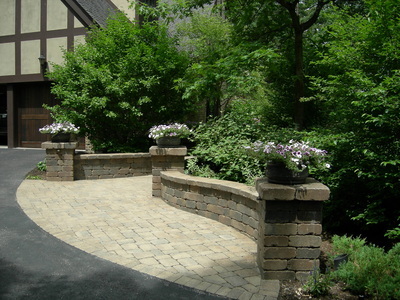 These hardscape improvements were installed utilizing the same brick material throughout the project. 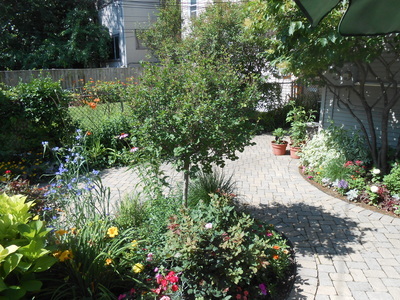 All tree, shrub and perennial flower plantings are new and were designed to tie the hardscape elements together and screen the property from views of adjacent homes. 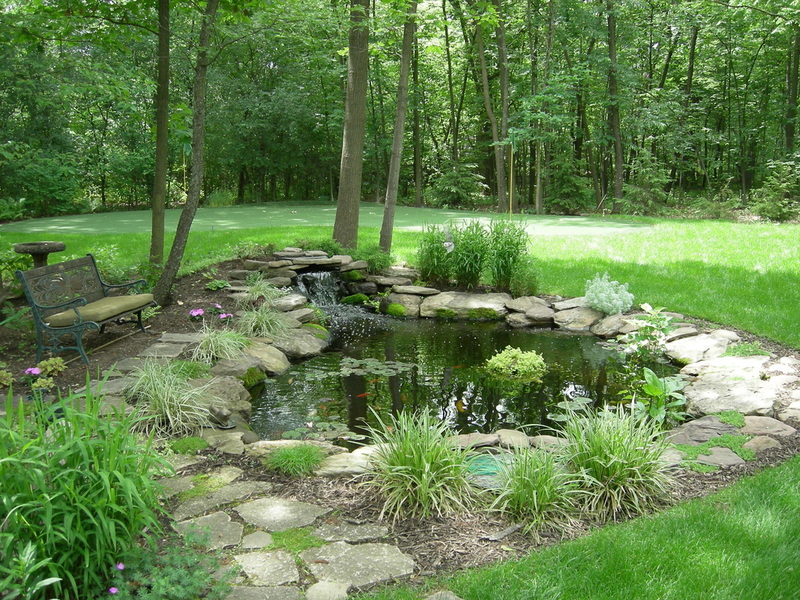 Finally, due to the flat nature of the site, we designed an elaborate underground piping system to ensure that rainwater would not stagnate and would properly drain from the low areas of the property. 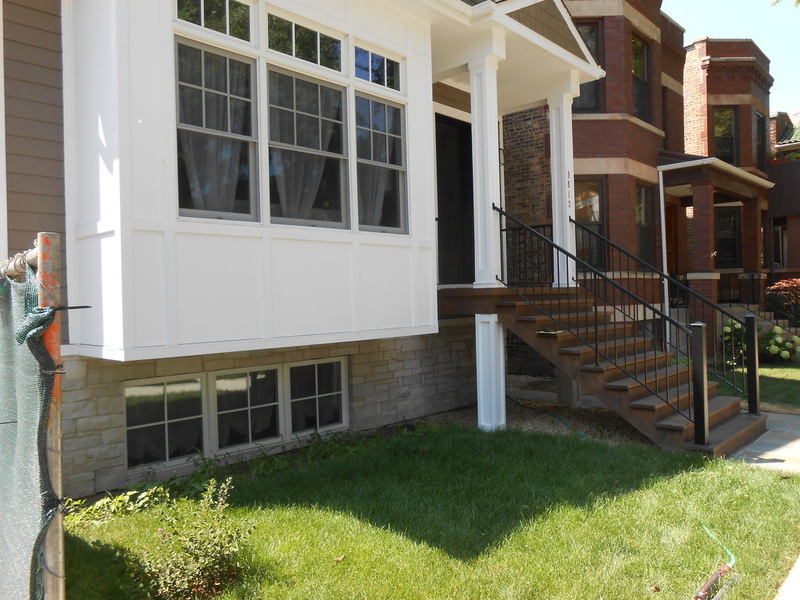 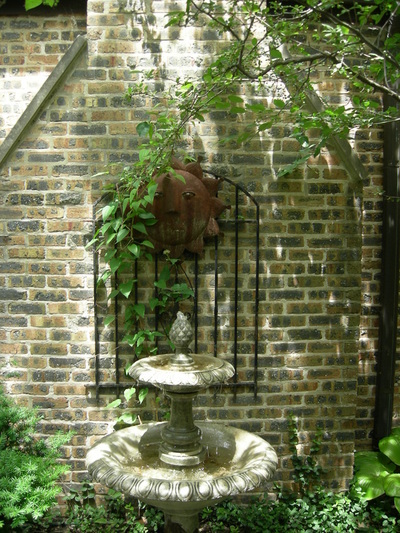 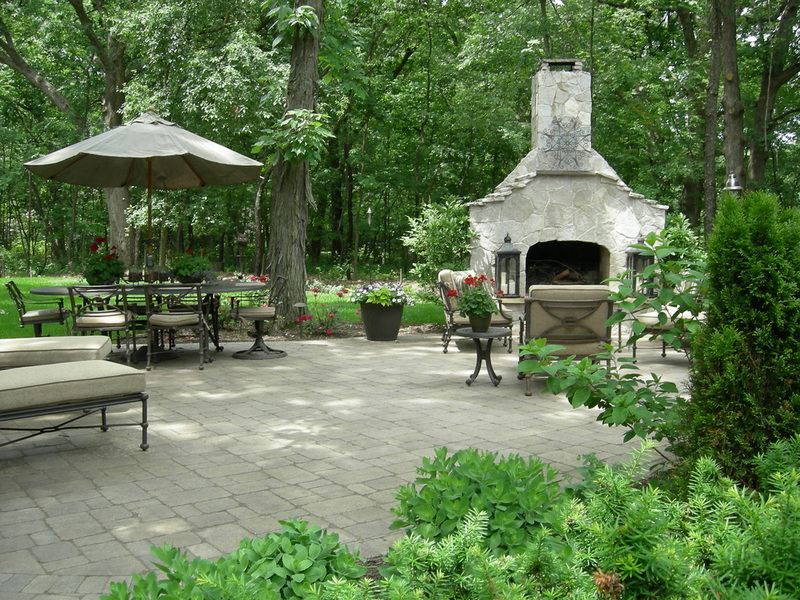 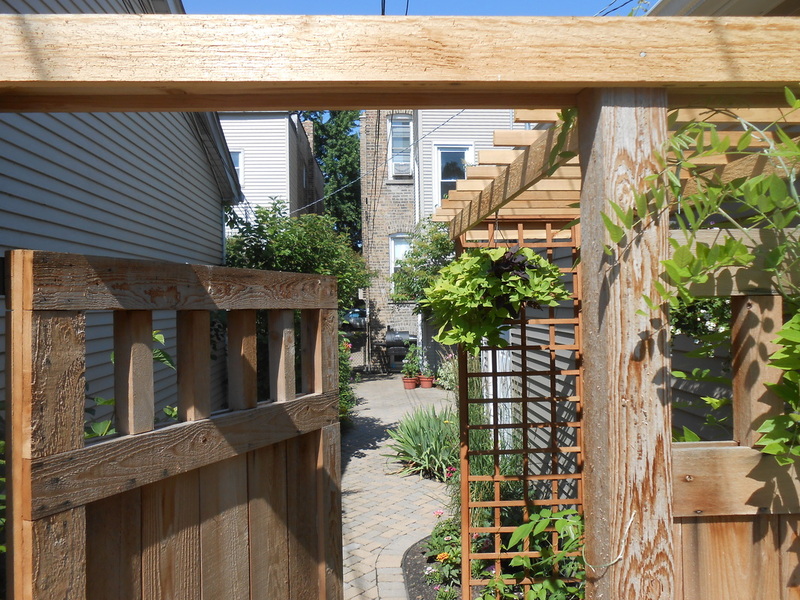 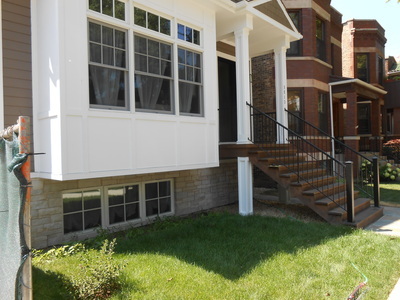 Ten years ago, we designed and built a new brick patio for the owners of this property located in the Northcenter neighborhood of Chicago. At the time, a large 25’ wide magnolia tree existed in the rear yard and the patio was designed around that tree as its central feature. 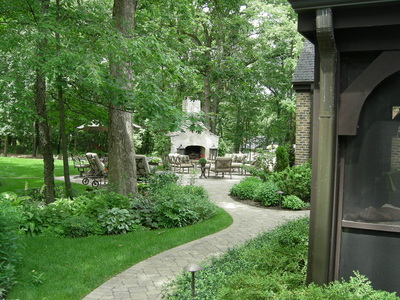 Unfortunately, that tree was lost due to disease and was removed when the homeowners had a new garage built. 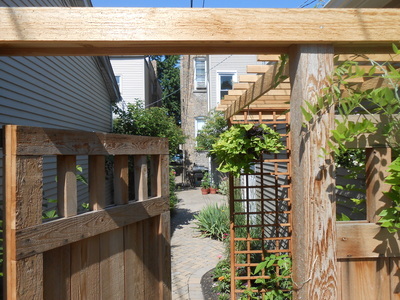 The loss of this tree changed the nature of the backyard from one that was densely shaded to a yard that now receives sun for the majority of the day. Wanting to take advantage of this situation, we were again hired by the client to rework the garden’s plantings to maximize the color they always desired, but couldn’t achieve in the shade. 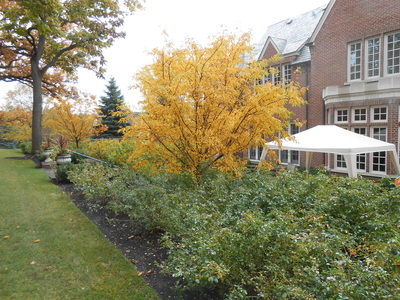 Two existing trees were retained – a Serviceberry and a Japanese Tree Lilac. 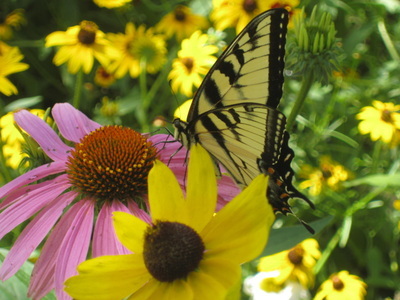 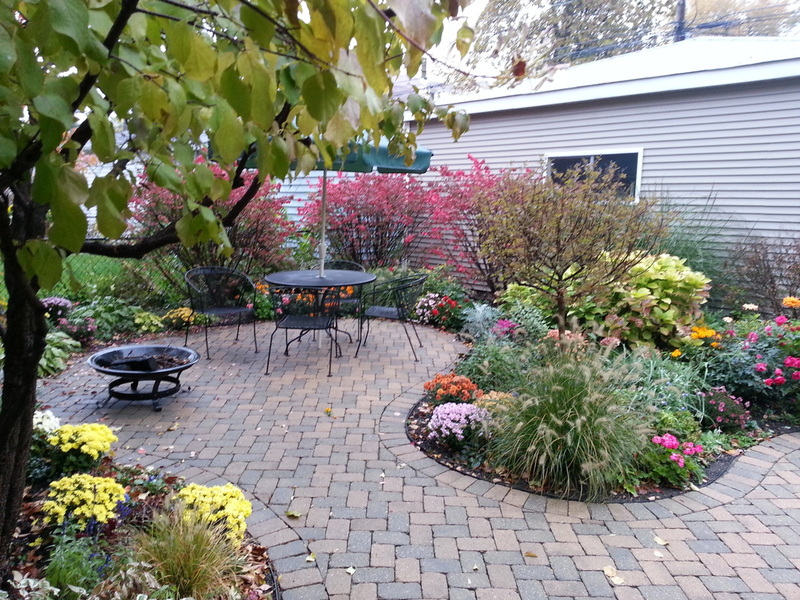 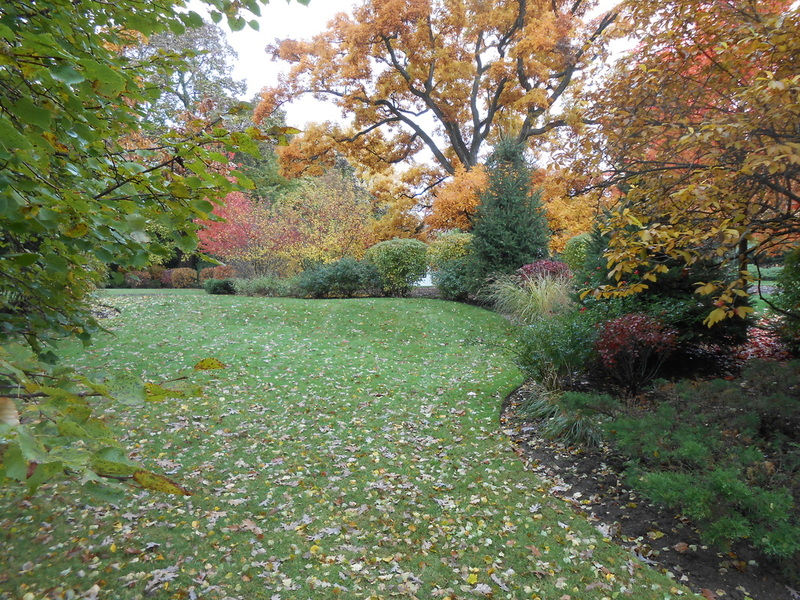 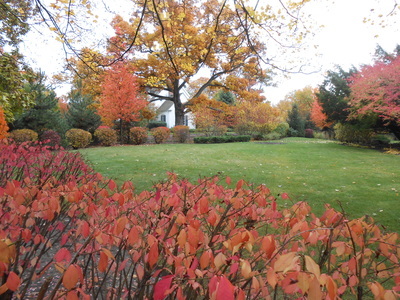 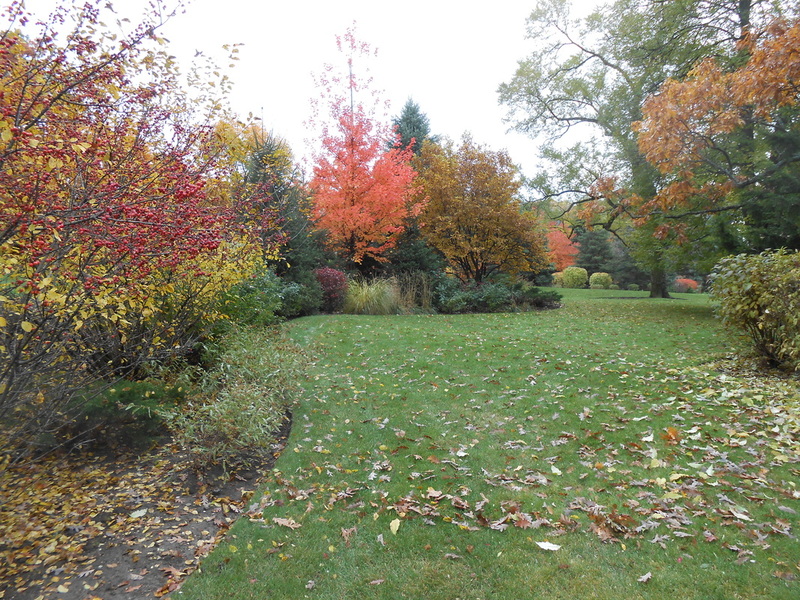 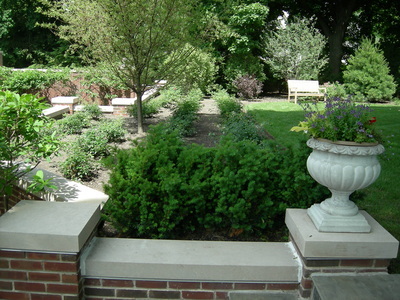 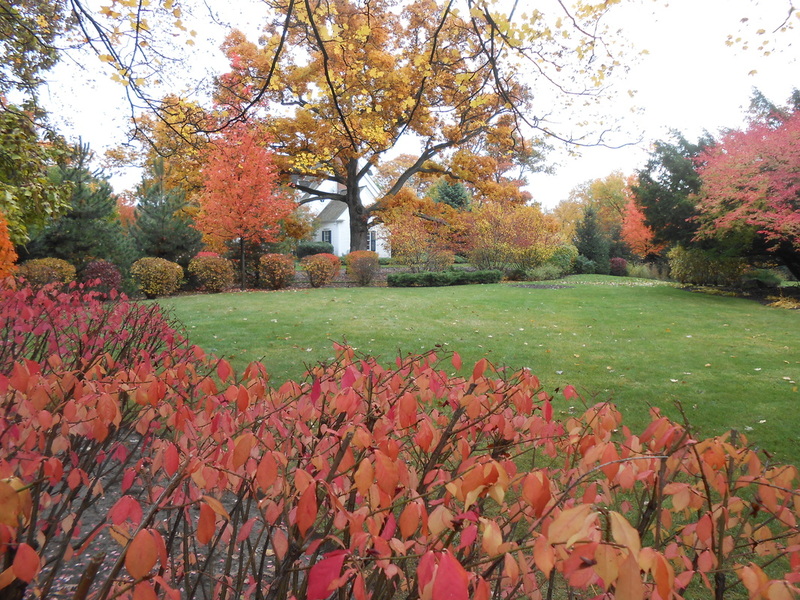 New colorful shrubs, perennials, and annual flowers were evenly divided in the remainder of the garden’s space. 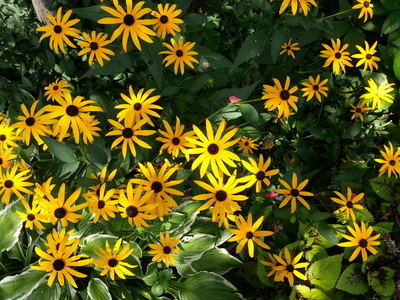 The annual flowers are seasonally rotated several times throughout the growing season to keep the color at its peak. 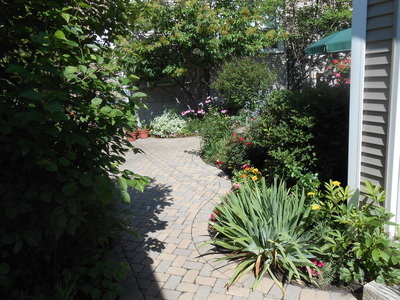 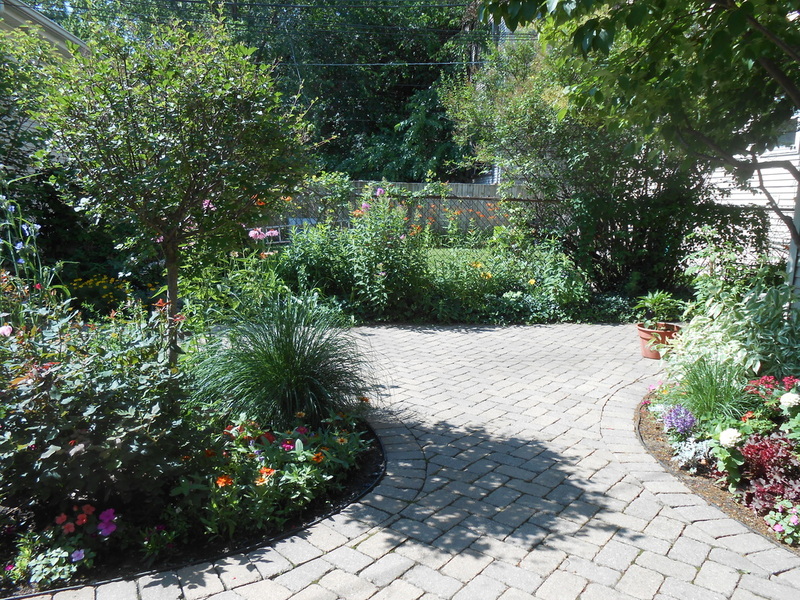 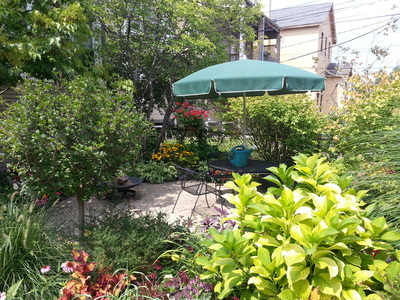 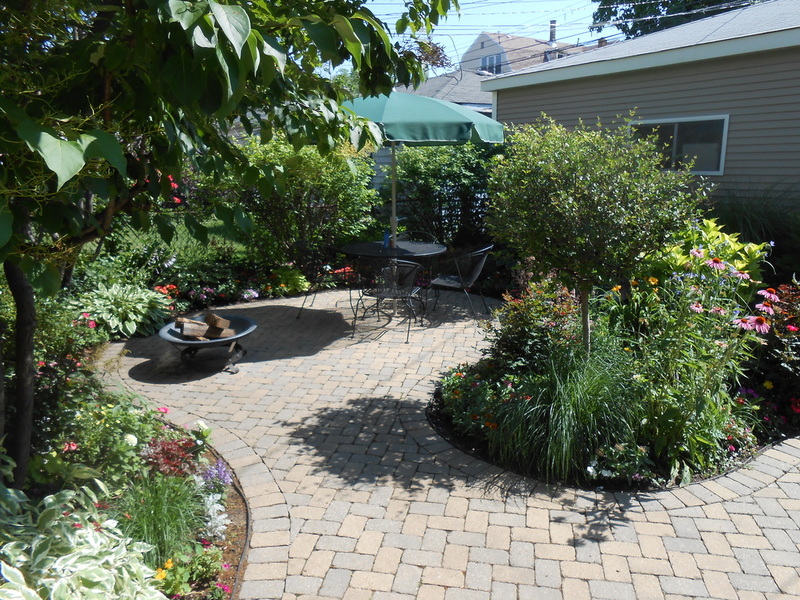 Our client tells us that their garden is now one of the favorites at the neighborhood’s annual garden walk. 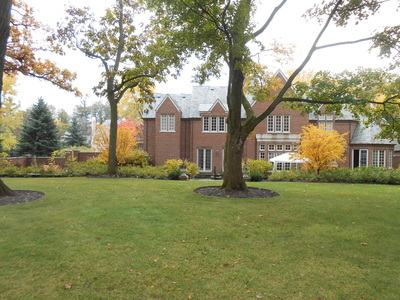 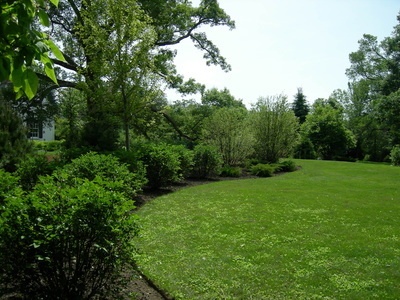 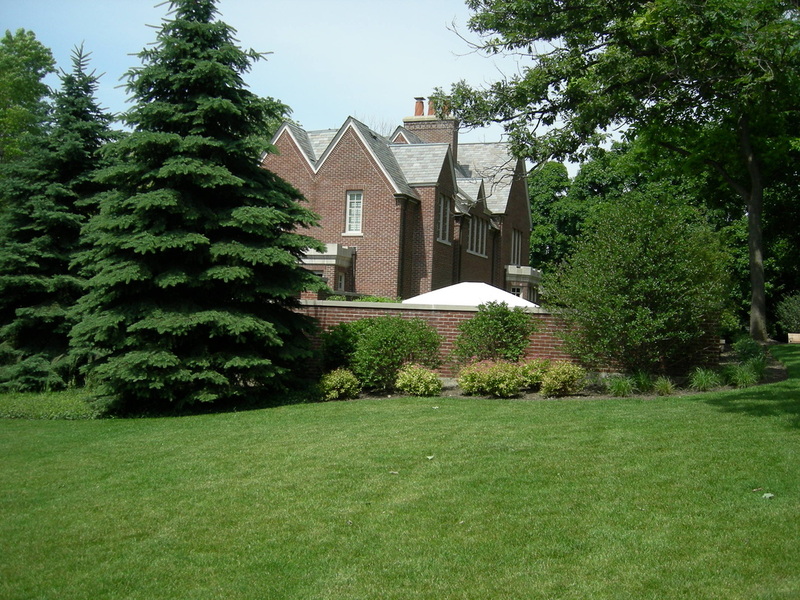 This 3 acre property is located in a prestigious neighborhood on the suburban North Shore. 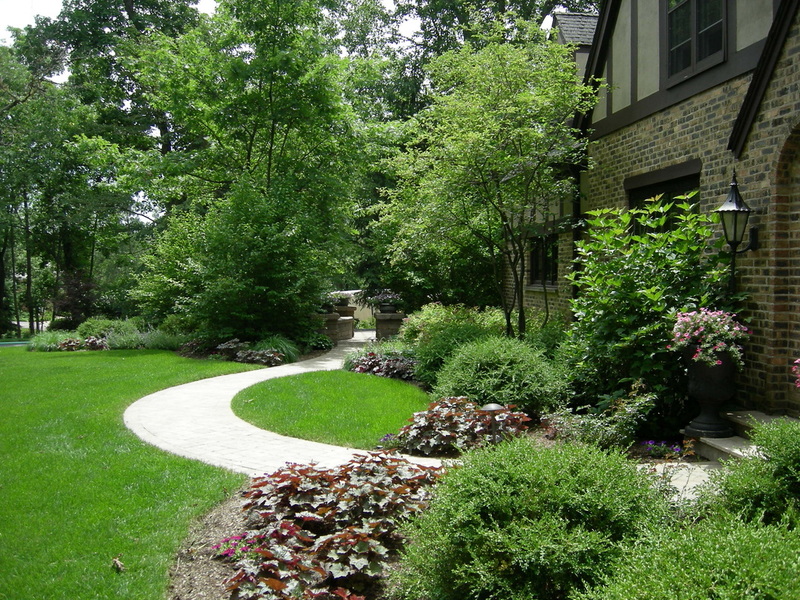 Our firm was hired by the homeowner to improve the overall landscape character of the site, particularly along 1200 lineal feet of the properties’ outside borders. 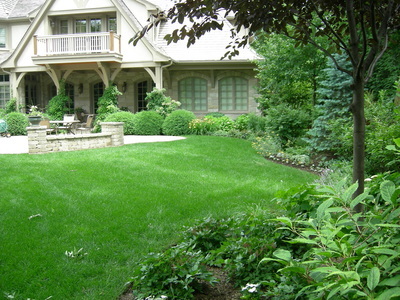 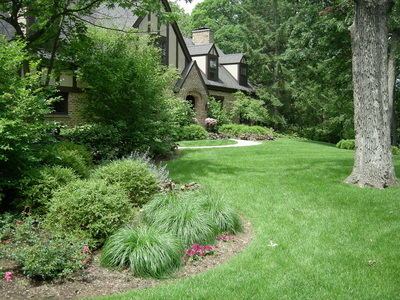 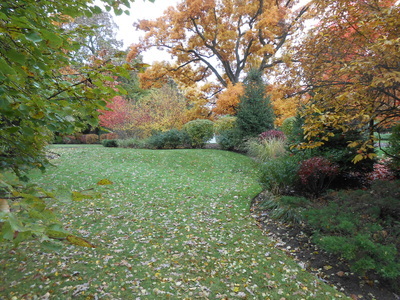 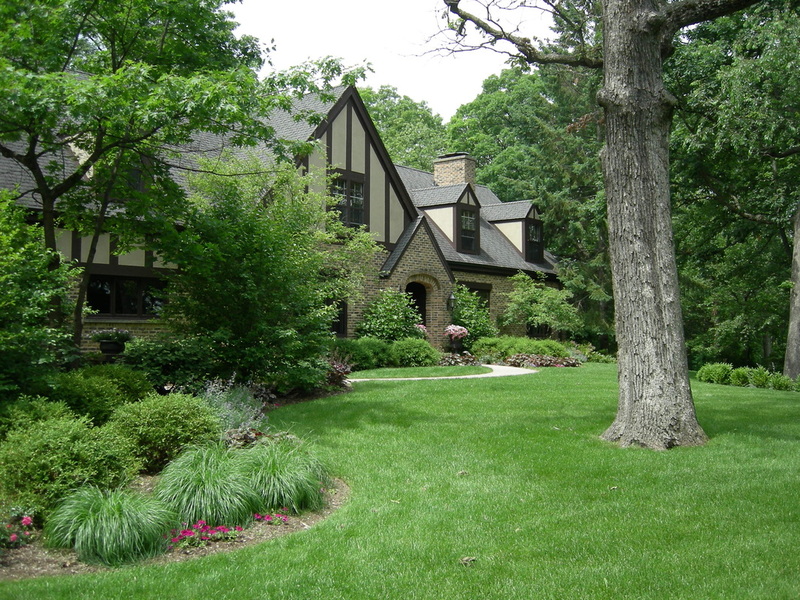 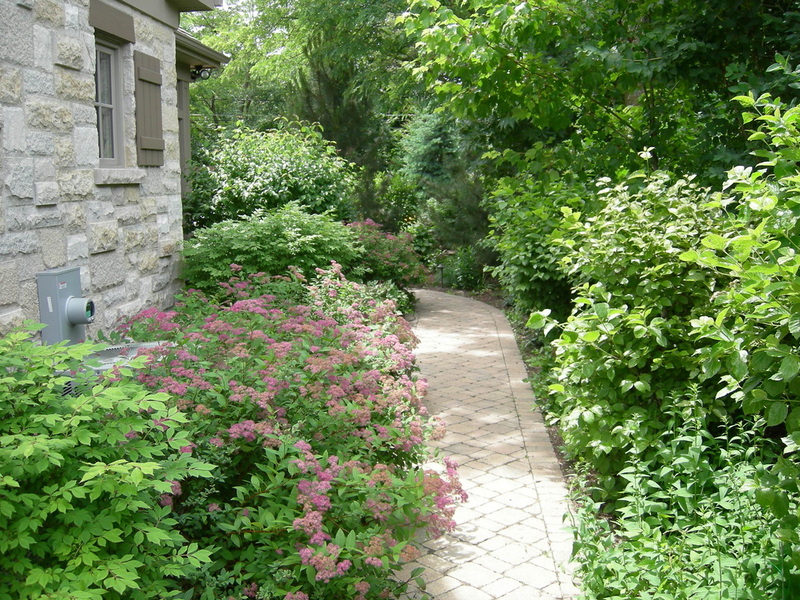 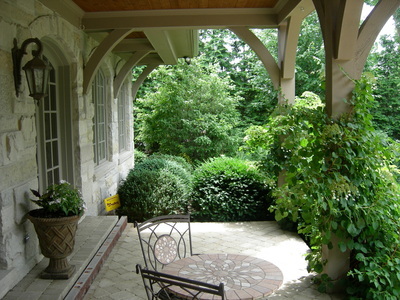 To achieve the owner’s desire to better screen his property from the street and adjacent homes, large natural serpentine shaped planting beds were created and over five semi truckloads of large shade trees, evergreen trees, ornamental flowering trees and shrubs were brought to the site and planted in these buffer areas. 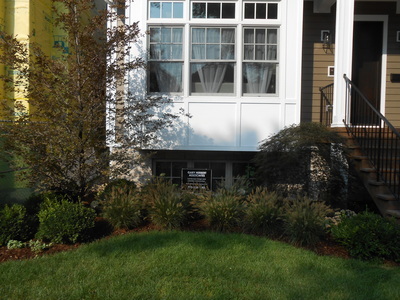 Planting enhancements bordering the home’s rear terrace area were also completed and included the planting of large crabapple trees, hydrangeas and several hundred low flower carpet roses. 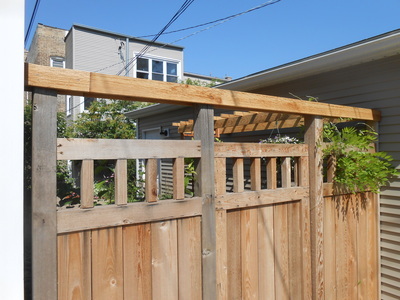 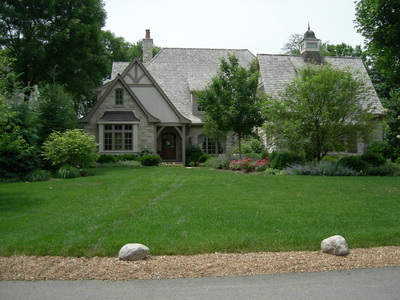 This was a tear down project where the client purchased a new construction home from the builder, devoid of plantings. 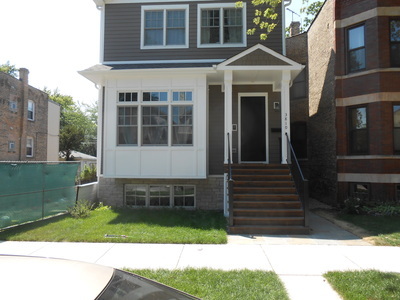 The residence is located in the North Center neighborhood of Chicago. The homeowner had distinct likes regarding plants and requested that a large specimen Tri-Color Beech and a Weeping Japanese Red Maple be incorporated into the landscape design. 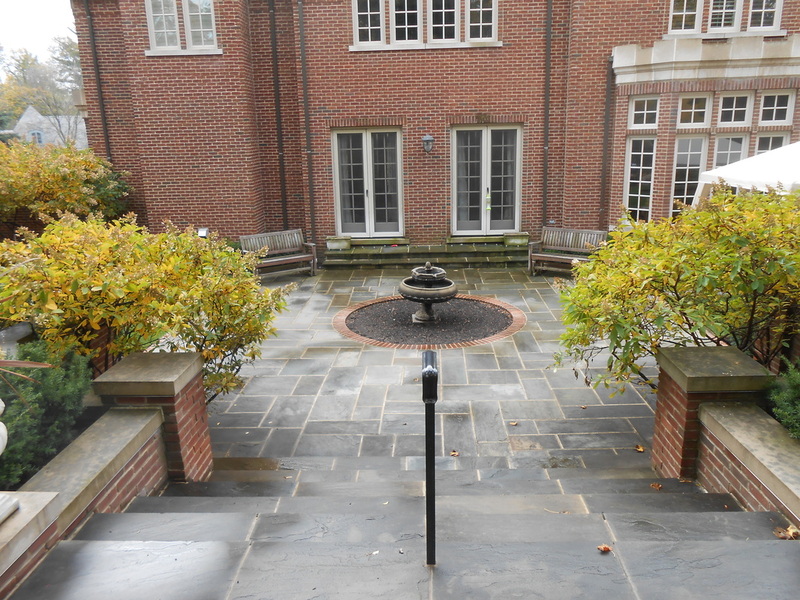 Supplimental shrubs that were planted include shade tolerant Green Velvet Boxwoods and Incrediball Hydrangeas. 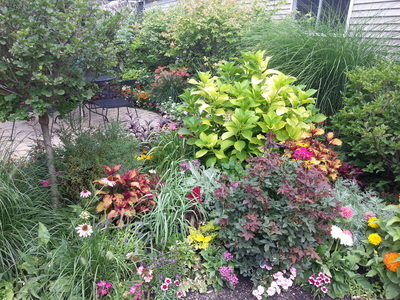 The larger plants are all tied together through the provision of a naturalistic mass of low ornamental grasses, variegated groundcovers and perennial flowers. Thanks for your interest in GARY HERBERT ASSOCIATES. 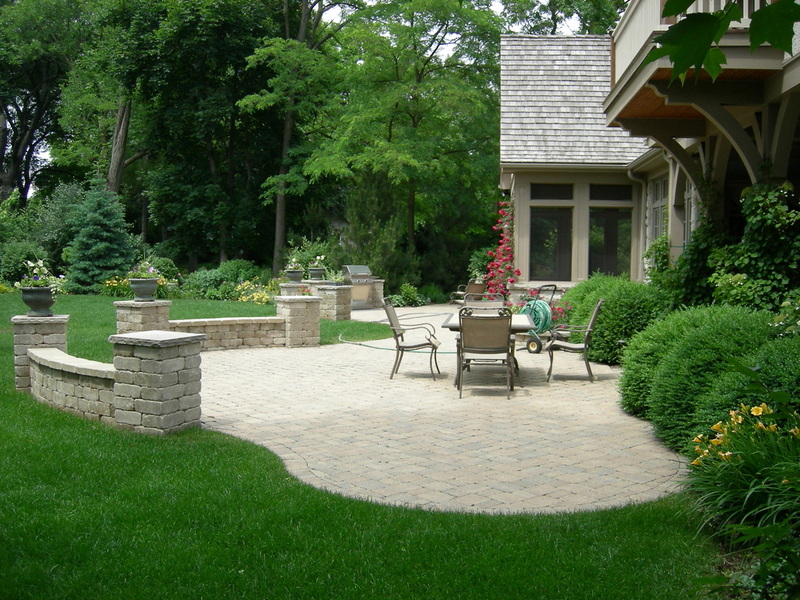 If you are considering making landscape improvements to your property - and want to do it right - we would like to talk to you. Click to button below to start the process and we will quickly respond to your inquiry. Thanks again!